Simon Black was born in Manchester in 1958, and attended Wolverhampton Polytechnic where he gained a BA Hons. in Fine Art and Printmaking in 1981. Over the following 27 years Simon developed a unique style and voice as a painter. In 1985 he attended a course at Rochdale College of Art on Continuing Study & Practice of the Arts where he developed his skills in etching whilst continuing to produce watercolours, many of which were detailed depictions of the world around him. In 1986 he began to work much more in oils and continued to do so until his untimely death in 2008. During his lifetime Simon exhibited regularly both in solo and group exhibitions including at The Mall Galleries, London; The Millinery Works, London; Art London 2003; Cornelius Gallery for Contemporary Art, Ross-on-Wye; Woodlands Art Gallery, Greenwich; Unicorn Gallery, London; and the Rona Gallery, London. 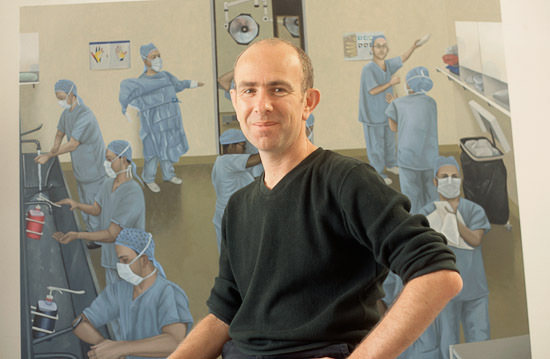 In 2001 Simon won the First Prize in the Art Royal Free Project, Royal Free Hospital and was commissioned to produce 6 works of art depicting life in the hospital . These works can now be seen hanging in the Atrium of the hospital, and the winning painting is also on display. Simon's last body of work was on the theme of Spirits of London and are typical of his keen observations of human life, his humour and his eye for detail that makes up a whole image that resonates, reflecting the world around us. Simon exhibited widely in London and the UK, and curated a number of exhibitions.